Inspiration from overseas - The worlds most famous car-free walk? 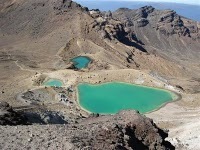 New Zealanders proudly proclaim the Tongariro Alpine Crossing as the worlds best one-day walk. Its a challenging 18.5 km hike across dramatic volcanic landscape in the heart of New Zealands North Island, where dark red craters with smoking fumaroles rise up amidst ancient lava flows that spread across the valleys. The sparkling Emerald Lakes provide the perfect lunch stop at halfway, followed by the Blue Lake and Ketetahi Hot Springs the natural wonders along this walk get more spectacular with each step. At times, the region seems like something from another world. Its no surprise the mountains of Tongariro provided the setting for Mordor in the recent Lord of the Rings film trilogy, with the textbook volcano of Ngauruhoe doubling as Mount Doom. With so much to see in one day, and the route being achievable for most walkers, the Kiwis have a strong claim to the worlds best walk title. Another great feature of this walk is that it is easy to reach without a car. Many of the thousands of walkers who visit each year use the specially arranged buses that serve the start and finish of the walk. Early morning, buses drop the eager trampers (the local name for walkers) at the Mangetepopo Valley the start of the route. After a memorable days walking, the weary crowds finish at the foot of the Ketetahi Track. Sitting in a forest clearing, they can check the days photos as they wait for the pick-up buses. This is how walking should be taking time to explore stunning scenery, walking from A to B, with no need to back-track halfway around and return to the car. 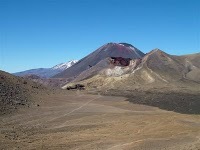 The linear nature of the Tongariro Alpine Crossing the famous geological features are handily spread out along the route makes these buses essential to many visitors. The transport system in this part of New Zealand runs so smoothly that few people even consider other options a big achievement in a nation where many people are dependent on cars. Fourteen local bus companies collect people from nearby Turangi or Taupo many of these are run by the backpacker hostels and guesthouses in these towns, making it an easy option for the backpackers that flock to New Zealand to go hiking. The several pick-up buses run throughout the afternoon and evening. This means there are no long waits for walkers who arrive earlier than expected and no rush to get a particular bus, allowing people to spread out along the route, going at their own pace. Its the same set-up for all of New Zealand's Great Walks when you book up the route, the Department of Conservation staff will help you to arrange transport to and from the walk. For walkers, its a cheap, reliable and efficient system. For the park managers and local conservationists, encouraging people out of their cars helps to prevent congestion and pollution on the roads that take people to New Zealands wild and wondrous outdoors. Most walkers tackle the three highest peaks Corn Du, Cribyn, and Pen y Fan as a circular walk from either Brecon or Storey Arms. A better day out is to complete the whole range in one go, continuing on to Fan Y Big and Waun Rydd . Buses could collect walkers from near the Talybont Reservoir and return them to the nearby towns, villages and campsites. This fantastic ridge demands to be done in one direction; theres no easy short cuts down. A dedicated and regular bus service for walkers could drop people off at Alt-na Reigh and collect them at the Clachaig Inn, which would also enable a linear traverse of the Three Sisters on the opposite side of the valley. This would reduce the number of cars speeding along the A82 and make the road considerably safer for everyone. Of course, there are many pitfalls that would need to be overcome, such as cost recovery, reliability, seasonality and persuading enough people out of their cars to justify the service (a bit of stick as well as carrot would be needed). But with so many keen walkers in the UK, its hard to believe the potential demand is not there. More buses run specifically to meet the needs of walkers would also help to further promote the UK as an ideal walking destination, especially for tourists who visit without cars. And who knows, one of our mountain ranges could start to challenge the Tongariro Alpine Crossing for its Worlds Best title.